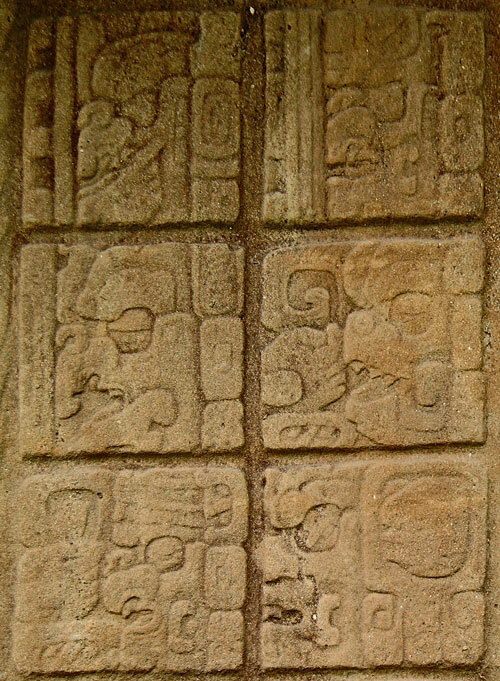 These are the date glyphs from the side of Stela A. The monstrous faces are the period of time and start with B’aktun in the top left, then K’atun in the top right, then tun is second down on the left, followed by winals second down on the right…and so on. You can see the dot (equalling one) and bar (equalling five) number system in the first three glyphs – the first equals 9, the second equals 19, the third 5, then the rest equal zero. So we have 9.17.5.0.0, which equates to 27th December 775AD.